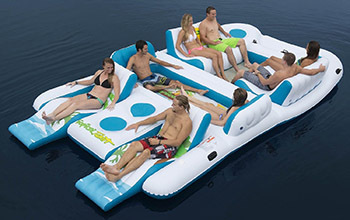 And if the layout of this thing doesn’t give you the end-of-life eye contact you’re looking for, check out Party Island, the sea-death lounger that also fits eight people, but in a more social seating arrangement. You could get the off-brand ten-seater for a bit cheaper, but this is the last thing you’ll ever do. Don’t cheap out. You can’t take that money with you, to your skeletal death, at the bottom of the ocean.